If you are interested in hiring off-duty police officers for security at an event or business, please contact the Human Resource Division at 444-5615. At least 21 years of age (18 years of age for watchman category). U.S. citizen or legal resident alien. Free of any type of chemical dependency. Watchman – A person employed without police powers and without authorization to carry weapons or protective devices. A watchman performs the tasks of observation and reporting on or in a designated area and may include patrolling a public street. A watchman has no powers of arrest, search or detention and must wear an approved uniform. Courier – A person employed to carry out the assignment of protecting/transporting property from one designated area to another. A courier must wear an approved military style uniform. A courier has no powers of arrest, search or detention. If qualified, a courier may carry a firearm. Security Officer – A person employed with certain police powers to protect life or property on or in designated premises. A security officer’s powers exist only within the established property owned or leased by the contracting employer and to incidents occurring on the premises. If qualified, a security officer may carry a firearm and certain protective devices. What must I bring with me when I come to the Private Security Section to apply for a license? You must have a color photo ID (valid driver’s license or state-issued ID card), and a dated letter from your intended employer (no more than ten days old). Payment of licensing fees can be made by cash, company or personal checks, and most credit/debit cards. What type of background check is conducted when I apply for a license? A complete background check is conducted using your name, date of birth and fingerprints. Information obtained from local police agencies, the Missouri State Highway Patrol and the FBI will be used to determine license eligibility. A felony conviction will automatically disqualify anyone from obtaining a license. Must I carry a security identification card while working? YES. The badge/identification card issued by the Private Security Section must be worn conspicuously if working in uniform or carried on the person if working in a uniform- exempt capacity. 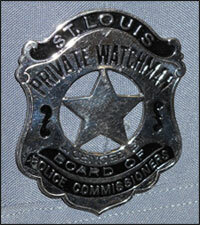 A metallic company badge may be worn but the word “police” must not be displayed anywhere on the uniform. As a security officer, may I make an arrest? Security officers have the power to arrest and detain in incidents occurring on company property. These powers are in effect only while on duty and on the premises you are paid to protect. Do all security officers wear a uniform? NO. As determined by the employer, some security officers are licensed in a uniform-exempt capacity and are not required to wear a uniform. How many licenses may one person hold? A person may hold a license for any number of employers as long as a letter from each employer requests it and the proper fees are paid. A separate license is issued for each company. When licensed and working for any given company, the appropriate license/ID card must be displayed on the uniform. How long is a license valid? Licensed security personnel are issued a badge/identification card which must be carried/displayed while security duties are being performed. A license is good for one year and it must be renewed annually. May I work on an expired license? NO. Working on an expired license or no license subjects you to arrest and booking. Companies or agencies that knowingly employ someone without a license subjects them to a fine and/or liability in a civil action. What are the requirements if I want to open my own contract security business? Generally, St. Louis City ordinance requires that persons wanting to establish their own security contract business have a minimum of two years experience in the security field, either as a licensed officer or supervisor/manager. Requirements for establishing a company can be found in a link at the end of this section. 1. The St. Louis Metropolitan Police Department and St. Louis County Police Department limits new agencies to persons who have served two (2) years in the security field, either as a licensed private security officer or police officer. Agency owner qualifications should be provided to the Private Security Section in the form of a letter. The letter should also indicate the intent to have uniformed or uniform exempt security officers and armed or unarmed security officers. 2. The firm should be registered with the Office of Secretary of State, located in the U.S. Customs House & Old Post Office Building at 815 Olive Street, Suite 210, in St. Louis. A copy of the papers issued by the Office of Secretary of State shall be made available for the files of the Private Security Section. These papers should include a listing of names of corporate officers to include their current mailing addresses. 3. Persons seeking to own or operate a security agency or in-house security force, who are unknown to members of the Private Security Section, may be required to provide picture identification that includes the applicant’s name, social security number, and date of birth. 4. Firms that presently are operational in other areas of the state, or in other states, to provide security service, shall provide a request on company letterhead to the Private Security Section before being granted a letter for presentation to the License Collector's Office. The letter should also indicate the intent to have uniformed or uniform exempt security officers and armed or unarmed security officers. 5. New agency operators, when applying for a license, shall present a color photo of the uniform to be used by the security agency. A company shoulder patch, approved by the Private Security Section, will be mandatory on all shirts, coats and jackets worn by armed, on-duty security personnel and will state the company name and the word “SECURITY.” Current rules prohibit the use of the word "POLICE" on patches or uniforms. Metal badges are optional but if used shall have “SECURITY” on the badge and will only be worn while on duty. 6. Once this information has been compiled, it may be sent/delivered to the Private Security Section where it will be reviewed in a timely manner. After reviewing this material, the Private Security Section will notify the owner/agent of the company of the outcome of the investigation and provide any additional instructions as necessary. 7. Individuals who meet these criteria and who will be doing business in the City of St. Louis will be provided a letter of introduction from the Private Security Section to the License Collector's Office, Room 104, City Hall. This letter will authorize the company to obtain a St. Louis business license, which allows the firm to hire private security officers, couriers and private watchman. A separate business license is not required for companies doing business solely in St. Louis County. 8. Once a business license has been issued by the License Collector's Office, a copy of the license will be forwarded to the Private Security Section for its files and at that time the company will be placed on active status. Individuals with questions may call the Private Security Section at 314-615-5348 (City) or 314-615-4656 (County). The Private Security Section is responsible for the processing, training, and licensing of all applicants for security licenses in the City of St. Louis. With the exception of St. Louis Police Officers, all persons performing a security function in the City of St. Louis must be licensed to do so through the Private Security Section. This includes police officers from other jurisdictions who are working in the City of St. Louis.